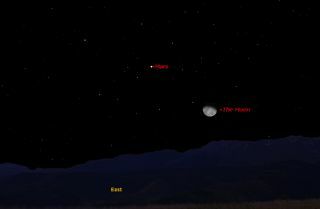 This sky map shows how the moon and planet Mars will appear together at 11 p.m. EST on Jan. 13, 2012 to observers in mid-northern latitudes. Skywatchers who venture outside tonight (Jan. 13) after 11 p.m. local time and look east-southeast will likely take notice of the waning gibbous moon and a very bright yellowish-orange "star" glowing well above and to its left. That "star," however, is actually the Red Planet, Mars. In truth, the apparent distance between our natural satellite and the world named after the Roman god of war will not be very close. The two will be separated by about 10 degrees; that's roughly the width of your clenched fist held at arm's length. The sky map of Mars and the moon here shows how they will appear this evening. What will make this a rather eye-catching configuration is the brightness of Mars at magnitude -0.1; it now appears to mimic the brilliant star Arcturus both in brightness as well as color. Beginning after midnight you can make a direct comparison, as Arcturus will shine 40 degrees, or "four fists," below and to the left of Mars. After all, for much of the fall and winter, Mars has appeared as nothing more than a moderately bright star. But from now through the early part of March, Mars will "flame on" as it rapidly approaches the Earth. By Valentine's Day, Mars will have doubled in brightness to magnitude 0.9 and its fiery hue will seem even more intense. Right now, Mars is right at the borderline between the constellations Leo and Virgo. It appears highest in the south around 4 a.m. This is the best time of night to look at it through a telescope, but you can also get an impressive naked-eye view when it rises like an orange ember, almost due east, mid-evening at around 9:45 p.m.
Mars will officially enter Virgo's boundaries Sunday (Jan. 15), but its stay there will be relatively short. On Jan. 24 the Red Planet will appear to become stationary against the background stars and then begin to retrograde or loop backward toward the west. In the next 81 days (until April 15) Mars will move back into Leo, appearing to come within 4.5 degrees of the bright star Regulus when it halts and resumes its normal eastward trek among the stars. Although Mars will be getting increasingly impressive-looking each day, this apparition of the planet is nearly the most distant in its 16-year cycle of close and far oppositions. Mars is at aphelion (its farthest from the sun) Feb. 15, so it will come no closer to Earth than 62.6-million miles (101-million kilometers) March 5. But keep this in mind when you see it poised high above the moon late tonight: Mars will be 86-million miles (138-million km) from us. And from now until March 5 it will be getting gradually closer to us by an average of about 459,000 miles (738,000 km) each day. If you have an amazing skywatching photo you'd like to share for a possible story or image gallery, please contact managing editor Tariq Malik at tmalik@space.com. Joe Rao serves as an instructor and guest lecturer at New York's Hayden Planetarium. He writes about astronomy for The New York Times and other publications, and is also an on-camera meteorologist for News 12 Westchester, New York.